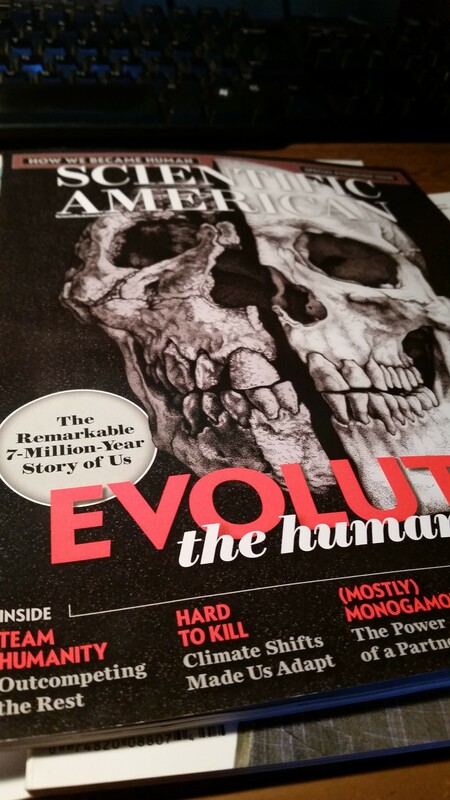 I purchased the September issue of Scientific American, which was oozing with human evolution. Needless to say, I couldn’t wait to examine the latest discoveries on display for public consumption. In Johannesburg, South Africa there’s a system of caves known as Rising Star. It’s here that researchers are collecting the fossilized remains of humans. Interestingly, they refer to these remains as an “extinct” member of the human family- as if they’re able to tell with certainty that no modern humans share any ancestry with them. This is interesting because the entire edition of this magazine is devoted to evolutionary revisions and the uncertain nature of science. In fact the headlines and associated blurbs present some remarkable admissions from the evolutionary community. This is because the usual evolutionary spin would lead us to believe that there’s no question that humans evolved from a single celled organism; that there’s no debate on whether or not evolution has occurred; and that there’s no controversy within the scientific community. According to this worldview, the only people who question evolution aren’t real scientists, so their opinions don’t count. Or so it goes. The headline proclaims: “Evolution Rewritten: Startling new findings are upending much of what scientists thought they knew about our beginnings.” This is amazing. Consider that evolution is taught as fact in public schools and colleges. It’s taught with absolute certainty, as if it’s the only thing that makes sense, and if one doesn’t believe it, then there’s no way that individual could possibly be a scientist, doctor, engineer, or even cope with reality- at least according to the usual suspects like Richard Dawkins and Bill Nye. And Nye has repeatedly made ignorant claims, such as, “Evolution is the fundamental idea in all of life science, in all of biology.” And if you don’t believe in evolution, then “Your whole world is just gonna be a mystery.” He’s wrong on both of those counts, yet his claims profess absolute certainty. So here we have a credible scientific magazine touting that scientists are revising virtually every chapter of the human story of evolution. What they originally believed and thought was all wrong. Wow! How can that be if we’re to believe anything the elite evolutionists have told us? If one has to believe in evolution in order to understand biology and life, but then be forced to continually change every previous belief because it was completely wrong, then how well was it understood in the first place? Obviously, not very well. Would it be fair, then, to say that evolutionists are the ones who don’t understand biology and life? If they really understood it, then all the changes would be unnecessary. Further, we’ve been told that the ability to make accurate predictions is a staple of science, but if that’s true, then these startling new findings should serve as a warning sign that evolution isn’t really science; the inability to make accurate predictions should have scientists rejecting it. But we don’t see that happening. Instead, evolutionists ignore these hurdles without any criticism. Therefore, I suggest that we need to be skeptical about what outspoken evolutionists like Dawkins and Nye have to say about science- especially when their beliefs are disguised as science. I’d like to see students be taught the importance of skepticism and the uncertain nature of science. The article goes on to highlight some of the exciting finds in Rising Star, including an entire population of humans. So far researchers have collected more than 1,500 bones and bone fragments- and there are many more that remain. The article presents a case study from the late 1990s in which secular scientists had a “pretty good handle on our evolution.” At that time it was believed that Neandertals and several Homo species arose in Eurasia about 4.4 million years ago and thrived for hundreds of thousands of years until a new species of Homo sapiens left Africa and drove the Neadertals and other species to extinction before spreading across the earth. Well, that view has now been soundly rejected, and new models have been proposed. We now have a hominin fossil from Africa supposedly seven million years old. Obviously, if we’re to believe that, then the human fossil record has been extended by more than 2 million years. Even the location of where humans evolved keeps changing. Humans supposedly emerged from East Africa, but then it was thought to be West Africa, and now some think they emerged from South Africa. Now scientists believe that humans left Africa hundreds of thousands of years earlier than previously thought. Another interesting admission is when the writer tells us that no chapter of human history has been as rewritten as the one detailing the ascent of Homo sapiens. But I have to wonder why that is. Isn’t it mainly because evolutionary history happened so long ago that nobody really knows what happened? We can’t go back in time and observe anything that happened while it was happening, so we must speculate and write a plausible story based on our beliefs about the past. If, for example, we believe all life arose from a single common ancestor, then our conclusions will reflect that. But if we believe that God created man in his image, and that he created animals to reproduce after their kind, then we arrive at a completely different set of competing conclusions. Another change outlined in the article is the cognitive divide between Homo sapiens and their ancestors. Scientists concede that Neandertals weren’t the stupid brutes they were once portrayed as; they used paint and jewelry, and buried their dead. Scientists are also admitting that modern humans share up to 20% of the genetic material of Neandertal, which means that our ancestors interbred with them, so they haven’t gone completely extinct. At the end the writer admits that anything reported in this edition of their magazine is not the final word- and she wouldn’t have it any other way. It’s nice to see that some people do recognize the uncertain nature of science. But the fact that she wouldn’t have it any other way is revealing on several counts. First, notice that she’s not questioning evolution; the fact that scientists were wrong about everything they once believed doesn’t bother her at all. I think students of evolution are being taught contradictory claims, and they learn to compartmentalize them. Students are taught not to question the certainty of evolution, and then taught to embrace the fact that science isn’t about certainty. So which is it? Both can’t be true unless there’s a way to justify the two opposing views in our mind. And that’s what happens. One claim is based on faith, while the other is based on science. The previous quotes by Dawkins and Nye are examples of faith-based claims- they demand that evolution be accepted without question and ridicule anyone who doesn’t conform. That’s a worldview based on faith. But the uncertain nature of science is undeniable because it’s easily observed. Let me provide another example of the religious nature of evolution that serves to insulate itself. The National Science Teachers Association (NSTA) tells us, “Because science is limited to explaining the natural world by means of natural processes, it cannot use supernatural causation in its explanations. Similarly, science is precluded from making statements about supernatural forces because these are outside its provenance.” Notice that it uses the words, “cannot” and “precluded”. This reveals what they really think about science. Refusing to allow any explanation that considers the existence of God and his creative work denies the uncertain nature of science. If God does exist, and if he really did create the heavens and the earth, and if he revealed that information to us, then such a position is nonsense. They refuse to acknowledge the uncertainty in science, but instead treat science as if it’s settled. If, however, they acknowledged the uncertain nature of science, then they wouldn’t be able to exclude supernatural causation. They would be forced to admit that supernatural causation is permitted. Worse yet, even though they tell us that science is precluded from making statements about supernatural forces, they end up doing just that by attacking those who believe God created the universe. Nonetheless, I think scientists would love to have certainty in science. But since they can’t, they’ve learned to accept it only when it suits them. They claim that the mysteries and uncertainty in science are beautiful, exciting and wanted, but when it comes to evolution, they are quite certain that it happened, even though they don’t know how it happened. Therefore, all these revisions are relevant to creation science. Creationists rejected all the past models of human evolution, and we also reject the current models. We were justified to reject the old models, and time will vindicate us in rejecting any current model. Lastly, I think this article reflects some of the clear differences between creation science and evolutionary science. One relies on revelation from God, while the other is completely man-centered. And what that means is that if the Bible really is the Word of God- as it claims- then we have access to the true history of humanity as revealed by God, and we don’t have to rely on fallible humans to piece together the past in a way that will always remain suspect. We can have a certain level of certainty based on faith, even though it’s outside the realm of science. In other words, science and faith are working together in complementary roles. Wow. Excellent post. Jonathan, you’ve nailed this one. I’ll be blasting the link out to my Facebook and Twitter friends. We will not mention that I wrote “one type”, and not “one typo”. Oy! I can only speak from my own personal experience and perhaps those of close friends, but never have I ever once been taught or told never to question evolution. And this is coming from someone who took evolutionary biology and biological anthropology in college. Every theory that I’ve ever been presented with, from the big bang up to evolution, has only ever been shown as a representation of the current evidence. There’s never been this militaristic certainty that I’ve seen which seems to be a common thread in the narrative that creationists are given. I think most scientists are thoughtful, respectful people who just want answers. For as much as I do like Nye (I hate Dawkins, as you know), he and other ‘pop culture scientists’ are really just greasy wheels. Just like I know that Glenn Beck and Rush Limbaugh do not speak for the entire republican party, so too should creationists realize that Dawkins is not our spokesperson. Just like those political pundits, he’s trying to sell books. I, personally, like skepticism and think that it’s healthy no matter where it is applied. But I don’t think we get to choose to what or to whom it is applied. People should be skeptical about any claim, scientific or religious. Neither should be beyond reproach. Sure, the textbooks themselves may not come out and say: “Thou shalt consider only evolution”. But their effect is essentially to say that without really saying it. I made a point of reading my son’s biology text carefully a few years ago when he began high school. The book never could explain how life began, but never once did the book back down from the “fact” that it must surely have begun all on its own — without a creator. Students are only ever presented that one viewpoint. And woe be unto the teacher who after teaching that section on the beginning of life goes on to invite the class to consider alternatives to the textbook’s failed explanation, alternatives such as a creator God as recorded in written history. Ultimately we cannot escape that the decision to believe in life arising spontaneously is in fact a faith-based position. It is religion. The evolution that follows is a state-enforced religion that is being crammed down our throats under the guise of being “science”. Well I can’t speak for Scotland, obviously, but here in America I don’t really see how anything is being crammed down anyone’s throat. If you don’t like what your kids are being taught in public school, send them somewhere else. Want to expose them more to the religious narrative? Send them to Sunday school or bible camp. Or take your kids to church, heaven forbid. It’s not the responsibility of the state to promote religious viewpoints. JS and I have had this discussion before, and if creationists want their side of the story to be taught in school that should be up for debate. However, if creationism does indeed end up in schools, it doesn’t have a place in the science class. You can’t scientifically test it. You can, however, scientifically study the fossil record, DNA, adaptation, and mutations –pillars of evolutionary science. Ryan, I can’t for some reason post this reply under your latest. Let’s keep our science classes focused on good, operational science. Bring on the fossils. Let the students examine them and discuss them and discuss and draw various interpretations. If the students and teacher want to discuss creation and subsequent flood as an interpretation, then let them. You may not like it, and most will not admit it, but you are taking a faith-based position when you accept the Big Bang and subsequent spontaneous generation and then evolution of life. It is a religious position, and hence the ongoing controversy. I hate it when wordpress glitches like that. No worries. I’m certainly glad I went back to check the thread! I would disagree that belief in that for which there is evidence requires faith. But that’s a wholly different discussion. We might not be able to recreate something like the big bang in a lab to observe, but there is a lot of evidence to suggest the theory has merit. The same could be said for evolution. I do agree, however, that science class should emphasize process over specific theories or models. Thanks Ryan. I didn’t mean to imply that anyone is actively teaching students not to question evolution, although it does happen. I believe there was an Iowa college professor who said any professor should have the right to fail any student in that class, no matter what their grade indicates, if the professor discovers that the student is a creationist, and that professors should be allowed to retract the student’s grade if they become a creationist later. Another Iowa professor said that creationism should be discriminated against. Then there’s the Dover trial that prohibited students form learning about creation, or being critical of evolution. But even if we were to exclude these examples of militant evolutionists, most teachers and professors don’t need to be; all that’s necessary is for them to do their job and teach evolution as fact without mentioning that the information isn’t fact, can’t be confirmed via the scientific method, or that anyone even questions it. Students will accept it as fact without question because that person is considered an expert, and few students have the aptitude to question what they’re being taught. My own college professors didn’t teach us not to question evolution either, but they did teach it as fact, even when I was able to point out flaws in their arguments that no one else caught. None of their mistakes caused them to deviate from teaching evolution as fact. In all the biology and anthropology classes I had, none of the professors presented evolution and the big bang merely as representations of the current evidence. I do realize Dawkins isn’t the spokesperson for all evolutionists, but you’re the first evolutionist I’ve encountered who isn’t an apologist of his. Every other evolutionist I’ve come across will defend him to the end. But even if he’s just trying to sell books, he really does believe what he says, and that’s key. But as for Nye- I used to like him a lot, but once he became a political activist for evolution and a thorn to creationists, I have lost a lot of respect for him. I do like your attitude of skepticism. A lot of evolutionists and atheists will say that, but they don’t practice that. Typically they’ll believe whatever is fed to them without question. Also keep in mind that evolutionists have also targeted children in private Christian schools, and some colleges refuse to accept students who went to a public school that publicly supports evolution. Patrick Henry College was denied accreditation because it teaches creation. Unfortunately there are militant evolutionists in America who are trying to crush anyone who questions evolution, and there aren’t enough good people out there to oppose them. And of course I’m all for leaving both evolution and creation out of science class, or allow teachers to teach both. Discrimination shouldn’t be tolerated.